On April 6, 2016, I made the decision to adopt a vegetarian lifestyle, following in the footsteps of my daughter Joy, who had made a similar decision two days prior. Soon afterwards, Joy threw down a gauntlet -- a challenge, if you will -- to join her in a 12-week program to commit to eating a plant-based diet with little or no dairy and eggs, in order to maximize our health, minimize our carbon footprint, and show compassion to animals. Pictured here is the gauntlet, the chart Joy created and gave me, which is now posted on the back of my bathroom door, where I see it often. Not only is it a visual reminder of my weight and exercise goals, it is my reminder that we are on an adventure, doing something truly worthwhile, and that whatever sacrifices we will make along the way will be worth it in the end. 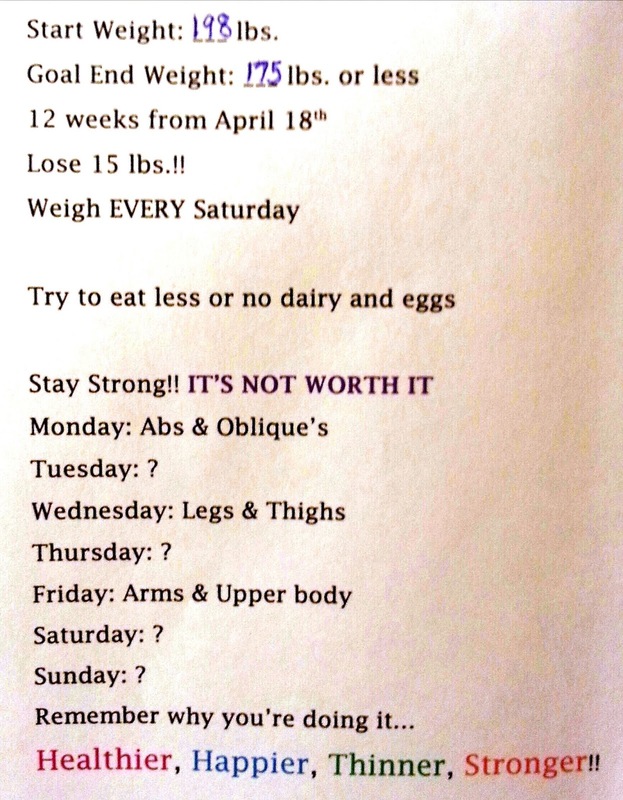 The chart also serves to motivate me and to keep me accountable to her, as she is to me. I couldn't be more proud of Joy for sharing her compassion, her vision, and her desire to make a positive difference in her world and in the lives of those she cares about. 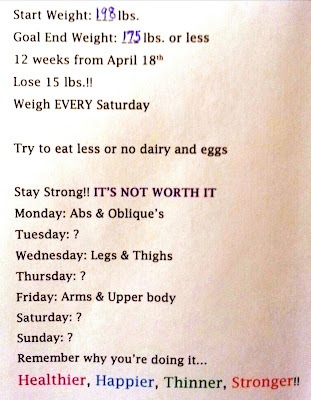 We are now in our fourth week of healthier living and two weeks into the 12-week program. Collectively we have lost 7 pounds since cutting animal products out of our diet. Maybe you are like me -- middle-aged, menopausal, or just struggling to get the number on your bathroom scale moving in the right direction. Or maybe, like us, you are an animal lover or want to effective positive environmental change. If that's you, we invite you along for the journey! Even if you don't take up the gauntlet and try a plant-food based diet, we encourage you to follow our journey on our blog, read or view some of the books and videos we have posted on our Links & Resources page, and educate yourself about the benefits of whole foods, plant-based diets, and environmental effects of food production, particulary in the way meat products are produced. I already don't eat that much meat at all anyway. I am taking TruVision and have lost 63 lbs and gone from a size 22 to a size 14-16. It's not a diet...just 2 pills twice a day and I love the energy. Best of Luck to you both. Will be following your journey. God Bless you! I really Miss the good Ole Days in Parkway Village!! Veggie Quesadillas -- It's What's for Dinner!